B. Thomas (Arlington, Texas, United States) on 6 February 2018 in Animal & Insect and Portfolio. 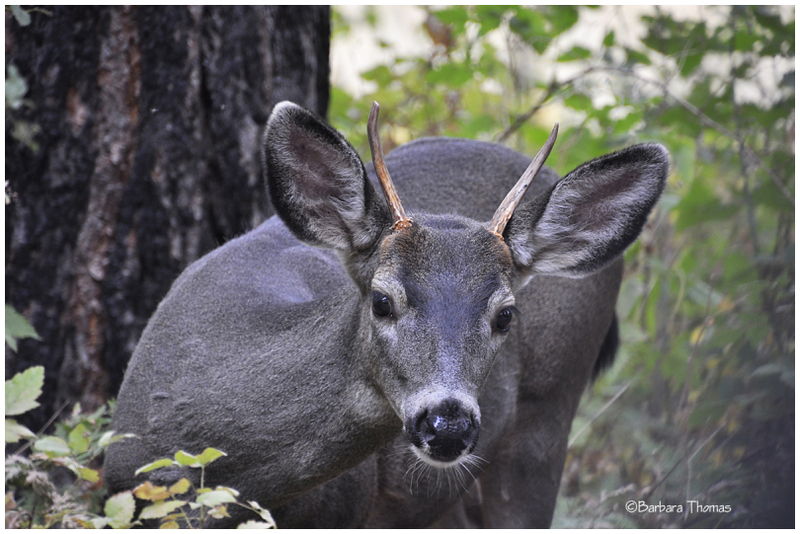 As we were hiking in Yosemite Valley this friendly young buck popped his head up from the plant he was eating and seemed to say hello. A beautiful detailed image, B.
Oh, yes, definitely connecting ! Amazing shot. He seems more inquisitive than frightened, doesn't he? Wonderful timely shot with very good action! I am surprised by the gray color! Happy ST. Adorable image. Avec ces cornes quel bel animal et vue merveilleux. This straigfht on facial shot of this fellow makes a very good Silly Tuesday picture. Must have been a great moment, a beautiful animal, I like the colour of his fur. :)) It really looks like he's looking for the camera. A well captured moment. I'm leaving for some days. See you on my return. Awesome clarity captured in this close-up shot!! What a handsome young guy. Beautiful portrait.